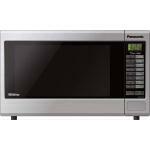 The Panasonic NNST671SQPQ is one of the top microwaves on the market. You will enjoy the many features that it has to offer. Plus, it is stylish and will look great in your home. One feature is Panasonic's Inverter Technology. Inverter Cooking Technology provides more control when you cook. This technology allows you to select high, medium or low power for the entire cooking process. This microwave cooks at 100% for the entire time that you are cooking. Users can choose Medium power to cook any dish and the Panasonic Inverter Microwave Oven will cook at that level the entire time. Your normal microwave will deliver 100 percent of the power when you turn it on. Delivering all of the power when it is turned On/Off can result in overcooked edges. This technology provides cooking sequences. Graduated cooking is excellent and provides users with more control when they cook. When you cook using a High Power setting, the power level is reduced when the food reaches the best cooking temperature. Panasonic's Inverter Technology provides power control continuously, during the entire cooking process. The best part is that cooking times can be minimalized. Everyone loves saving time. This microwave is perfect for busy families. The lightweight Inverter circuit also allows Microwaves to combine a compact footprint with the versatility of generous internal space. The best part is that you can easily enjoy pre-programmed cooking cycles for popular foods such as beef, rice, and pizza. The Sensor works to adjust power levels to deliver well cooked foods. When you are reheating food, you just need to touch the Sensor Reheat button & the oven will calculate the ideal reheating time. An added feature is turbo defrost. It is perfect for defrosting foods in no time. Take advantage of this system that provides energy in a better way, resulting in fast, thorough defrosting. Additionally, there is a child safety lock on this microwave. It offers extra security to prevent children from hurting themselves. Panasonic has developed the Panasonic NNST671SQPQ with users in mind. It is safe and provides all the features you need. Plus, it is energy efficient and will save you money.